I wanted to do a Month Long Marathon for May... but I needed something that would be fairly short since I will be going on a full week vacation next week to the Smokey Mountains. So I will not have as much time to watch movies this month as I usually do. Back in 2001 The Academy Awards added the category of Best Animated Feature film. And I have all but 2 of them in my collection. Thankfully the 2 I don't have Danae Cassandra had in her collection. I am not watching these in any paticular order... just watching them as the mood hits. Below is the list of films. Going by the trailer of this one I had the feeling I would enjoy it. And the film did not let me down. I liked how they portrayed all the dead as skeletons. I also like how they portrayed both worlds. And I definately got a kick out of Donte the dog. Time really flew while watching this one as it was over before I knew it. This one definitely gets a recommendation from me. 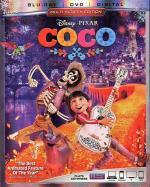 From the imaginative minds of Disney•Pixar comes a major "emotion" picture beyond compare. Experience the hilarious and heartwarming film Peter Travers of Rolling Stone calls "a burst of pure imagination." Do you ever look at someone and wonder what's going on inside their head? 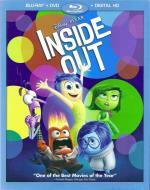 Disney•Pixar's Inside Out takes a rollicking journey into the mind to find the answer. Based in Headquarters, the control center of 11-year-old Riley's mind, five emotions are hard at work, led by lighthearted Joy. She strives to make sure Riley stays happy as she operates alongside fellow emotions Fear, Anger, Disgust and Sadness. It's "an instant classic," raves Richard Roeper, Chicago Sun-Times. Experience it like never before on Disney Blu-ray! This is a fun animated film. And I like the idea behind it. Emotions as characters in the brain... running the life you live. I lke how this shows that even sadness is an important part of life. I can see how this film could help children understand that fact. And it is all done in an entertaining way. Well worth the time put in to watch it. Recommended!